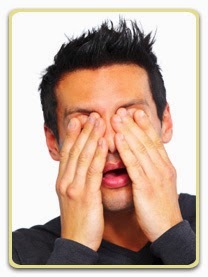 Popularly referred to as “ophthalmic” or “ocular” migraines, this common condition primarily causes visual symptoms and has the official classification from the International Headache Society of “ancephalgic migraine with aura.” Ancephalgic means that there is no headache and the term aura refers to the visual symptoms experienced. This condition is distinguished from a classic migraine in which a headache is a predominant symptom, and the far less common and more serious condition known as a “retinal migraine”. Today’s Health Tip deals with the more common and possibly misnamed ophthalmic or ocular migraine. What is a migraine? Migraine is a common neurological disorder usually associated with one-sided, throbbing headache. Up to 12 % of the U.S. population have migraines. At one time migraines were thought to be caused by constriction of blood vessels but more recent research involving the use of imaging studies indicates that there may be actual structural changes involving the white matter of the brain. Migraine sufferers have different triggers or precipitating factors for their headaches, such as fatigue, bright lights, weather changes, and others. In the classic migraine the aura precedes the development of the typical symptoms—one-sided headache, nausea, light sensitivity, etc. How serious is an ophthalmic migraine? Often someone with an ophthalmic migraine will have just the visual warning signs or aura of their migraine attack without the headache. Characteristically these visual symptoms affect both eyes, last around a half hour and resolve on their own. While they can temporarily interfere with activities such as driving or reading, they are not considered to be serious. In contrast to the ophthalmic migraine, the visual symptoms associated with the retinal migraine affects only one eye and can cause temporary blindness. When should a doctor be consulted? Since it can be difficult for someone who is experiencing unusual visual symptoms for the first time to know whether they are related to a benign or serious condition, it is a good idea to see an eye specialist for evaluation. Is treatment available for ophthalmic migraines? Because they generally are harmless and typically resolve on their own, ophthalmic migraines usually require no treatment. Since they can adversely affect driving or performing certain tasks, it is best to stop these activities and relax during an episode. By keeping a journal of your diet and activities it may be possible to identify something that consistently triggers the migraine, offering an opportunity to avoid the precipitating factor. Treatment, including medicines designed to prevent future attacks, is available for frequent ophthalmic migraines, particularly if a headache is a part of the symptom complex. The terms “ophthalmic”, “ocular”, and “retinal” migraines are often used interchangeably and sometimes inappropriately. If you are labeled as having one of these, be sure that you understand which specific condition applies to you. What is commonly referred to as an ophthalmic or ocular migraine is actually the aura of a more typical migraine, often without the headache component.